Although only four of his artworks are known to have survived, Joseph Pickett is today considered one of the foremost self-taught American artists of the early twentieth century. Pickett’s father, Edward Pickett, moved to New Hope, Pennsylvania in 1840 to repair the locks on one of the canals there; once finished, he stayed on to build boats. Born in New Hope some eight years after his father’s relocation, Joseph Pickett also learned boat building, but he was not to make his living in the family trade. He instead found work in various traveling carnivals, frequently operating shooting galleries, and returned to New Hope each winter. At approximately forty-five years of age, Pickett married, and thereafter left the carnival circuit altogether. He settled permanently in New Hope with Emily, his wife, and opened a general store on Mechanic Street. In June of 1912, Pickett bought and moved into a larger store on Bridge Street. 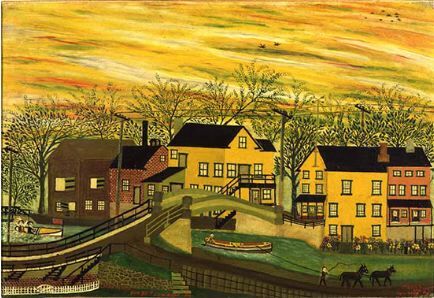 This building and its living quarters are pictured in Sunset, Lehigh Canal, New Hope, his last known painting. Pickett possessed both a fertile imagination and an aptitude for working with his hands; among the creations credited him are a house and an addition to an existing structure, a pair of calfskin boots, a chest of drawers, and a barber chair of his own design. Pickett may well have embellished his carnival booths, and in They Taught Themselves, Sidney Janis notes that the artist enhanced his store’s façade with a mural. It seems that Pickett turned more seriously to painting only after he married, gradually trading house paint for more conventional artist’s supplies and making pictures in the back room of his store. Pickett’s painted surfaces consist of numerous layers of pigment, sometimes thickened with sand.